The macro segments and classifies human spermatozoids nuclei (DAPI) based on the number of FISH signals (spots) they contain. It reports the percentage of occurrences of user defined classes (combinations of spot multiplicity in the FISH channels) as well as the position (point selections) of the detected nuclei falling in these classes. 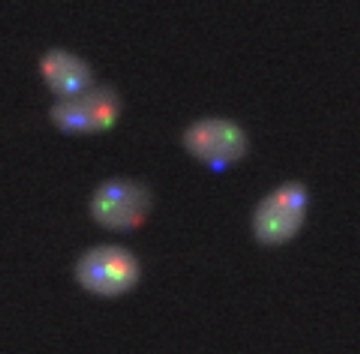 The input image should be an hyperstack with 4 channels: DAPI (first channel) and three FISH channels. The images are typically obtained as a maximum intensity projection of few channels (confocal) or a single z slice acquisition (widefield). Example image available in the linked page.